I've apparently established myself as a bit of Facebook guru, and I kinda like it that way. Over the past few weeks I've bumped into a number of "strangers," who, as it turns out, are Facebook friends or are interested in the Facebook phenomena. Since there are few things I love more than my lovely "fbk," I'm providing a series of Facebook 101 tutorials here at Barbie blog. I've conducted workshops on social networking, social media and Facebook in particular. If you'd like a copy of my powerpoints or if you have questions that aren't answered here, please feel free to comment or email and I'll do my best to help get you started. - What are social networking sites? Social networking sites build online communities where people with shared interests can connect to each other. -What types of social networking sites are available? Personal Sites (i.e. Classmates, Friendster) - these sites are primarily used to connect socially with other individuals. Classmates is a site with paid upgrades that allow you to connect with past and present schoolmates. Friendster is a free site that allows you to connect with friends. These are less popular and you may be dissatisfied with the level of connection you are able to achieve with your "real life" contacts. Professional Sites (i.e. Linked In, Zoominfo) - these are similar to the personal sites, but are used specifically for professional networking opportunities. Linked In allows you to connect with past and present colleagues, associates, supervisors, etc. and provides a forum for resumes, references, etc. Zoominfo compiles media and web links highlighting your work as a professional and compiling a profile based on this information. Whether you sign up for Zoominfo or not, you PROBABLY have a profile on the site. I highly recommend that you visit the site to see if it has tracked you, claim your identity and modify any information that appears on your profile as necessary, especially since it can also compile personal information such as phone numbers, addresses and email addresses. Combination Sites (i.e. Facebook, MySpace) - these sites are a hybrid of the two listed above, as many use them for both purposes. Many businesses and organizations have also developed a presence on these sites, as it is a free and easy way to connect with stakeholders and is often easier to maintain than a stand-alone website. ***A WORD OF CAUTION: Before signing up for these sites, make a conscious decision about what you will use your account for. For example, do not sign up using your work email address without first checking on restrictions. I STRONGLY RECOMMEND that people wishing to keep their personal lives separate and private from their work lives sign up using ONLY a personal email account, or, create 2 separate accounts - 1 for personal use and 1 for professional. While there are many options available to establish different privacy thresholds, this is not foolproof and your best bet is to just keep things separate from the beginning. 2. Blogs (i.e. Wordpress, Blogspot, LiveJournal) - If you're reading this, you probably already know what a blog is. If you need me to go into more detail, let me know. They're maybe not specifically social networking (moreso web publishing and journaling), but there is a definite social component. type of media. Flickr, for example is used for photos, YouTube for videos, and Google for everything from videos, photos, books, websites and more. 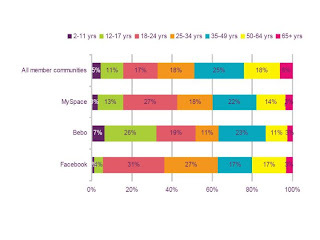 - Who uses social networking? Social networking is for EVERYONE!!! No, really, it is. Many people mistakenly assume it's for kids and while certain sites are geared more toward a particular demographic, 35-49 year olds are one of the largest groups of people using these sites. 18-24 year olds and 50-64 year olds also make up a huge percentage of users. Chances are, many people you know are already using these sites and you should probably be one of them! (This graph uploaded pretty crappy, but you get the idea. - What are the benefits of social networking? Can't see the grandkids as often as you'd like? Hate talking on the phone? Looking for a place to find local activities and businesses of interest? Social networking sites can help with all of these issues. The sites are simple and convenient (once you learn a few basics), and you can log on or off only when you're interested in connecting with others. You can learn about and RSVP to various local events through the sites and make connections with new friends who are interested in similar groups, activities and issues. You can connect with family and friends who, in an increasingly busy world, are less easy to pin down than perhaps they once were. You can, often, chat live with these loved ones through the site, keep up on important events like birthdays and anniversaries, see newly updated photos without having to weed through emails, etc. You can also take advantage of the targeted advertising through many of these sites, which includes ads that are based on your existing interests. No more nuisance "free iPod" pop-up ads; the ads on these sites are truly tailored to your needs. You can also find solace in the fact that you will no longer be a technological "untouchable;" you'll be in tune with what everyone else is talking about! More details on Facebook coming in Part 2, as per your requests - if there are others that you'd like additional details about, let me know. Deciding which site to use can be daunting; I happen to have accounts with most of these sites, but if you're a beginner, you may prefer just one site to start. Sites that I'd encourage you to register with are marked with an asterisk. Any questions? More info on actually setting up your Facebook coming soon! So excited, my tutorial has begun !Perhaps I WILL join FB soon.